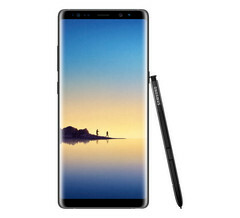 The latest entry in the Note line is finally here, and it's exactly as the recent leaks and rumors predicted. Inside and out, the Galaxy Note 8 resembles a fractionally-larger S8, but with a new camera setup, an added S Pen, and a few UI tweaks. After tons of rumors and speculation, Samsung has finally made the Galaxy Note 8 official. The event held in New York City provided few surprises, but it did confirm many of the details leaked in the weeks prior to the Note 8's launch. Specs, design, even an imminent pre-order date—it was all revealed earlier today. Additional features include an iris scanner and fingerprint sensor, the latter of which is still inconveniently placed next to the rear camera, just like on the Galaxy S8. Speaking of the S8, the Note 8's looks quite similar to its "smaller" siblings, confirming many of the renders and images leaked beforehand. A Galaxy S8++, if you will. An IP68 resistance rating and Samsung DeX dock support round up the list of features. As with previous Note devices, the Note 8 comes with an S Pen. This year's iteration features new tricks and improvements, such as creating animated messages, taking and editing notes, and even translating phrases by highlighting them. The phone's UI comes with some convenient enhancement as well. For example, App Pair is a quicker way of launching two apps at once. It lets you set a pair of apps to open in Multi-Window mode, one on top of the other, when a shortcut is clicked. This can come in handy if you like to, for example, stream video and post on social media at the same time. The Note 8's main camera setup is a first for Samsung. The two 12 MP cameras feature optical image stabilization and support depth of field effects, even after the photo is captured. One of the cameras has a lens with a wide-angle f/1.7 aperture, while the other has a telephoto lens with an f/2.4 aperture that lets you take narrower, close-up shots of distant subjects. You don't have to choose between one or the other, though; the Note 8 can take pictures with both cameras at once. Pre-orders for the Note 8 start tomorrow, August 24, at midnight. The device will be available in two colors: Orchid Gray and Midnight Black. Those who order the phone before September 24 are eligible for a special promo bonus which offers either a free Gear 360 VR camera or the "Galaxy Foundation Kit" which comes with a fast wireless charging dock and a 128 GB microSD card. By the way, the Note 8 releases on September 15, so even if you don't pre-order it you can still qualify for these free goodies.